Hello my dear viewers! I'm feeling extremely creative this week, so here is another felt tutorial for you. 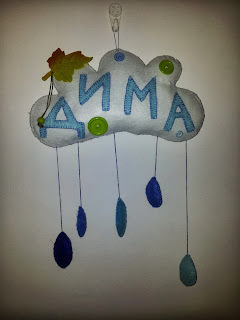 Today, I'm going to show you how to create this cute Baby Name Cloud with hanging droplets. 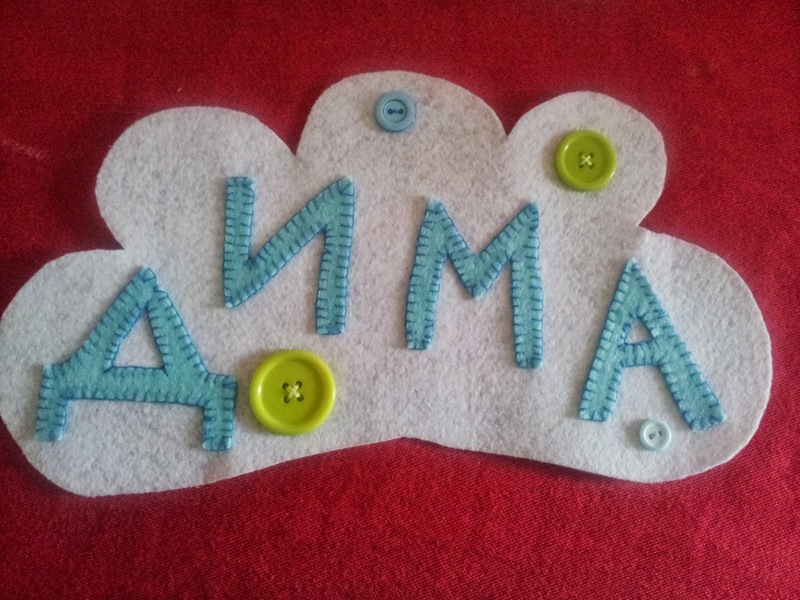 This cloud is made for my little nephew who will be here soon, so I had decided to create something cute for his nursery. The name on the cloud is in Russian, but of course you can write in whichever language or style you prefer. For this tutorial you will need fabric glue, different colour threads and felt material, pins, needle, cotton and a pair of sharp/good quality scissors. 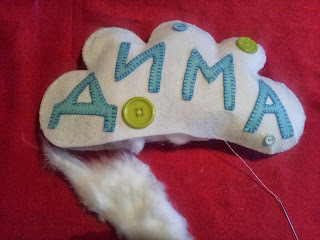 The reason for good quality scissors is to easily cut out neat felt shapes as felt can be very fluffy and hard to manage. 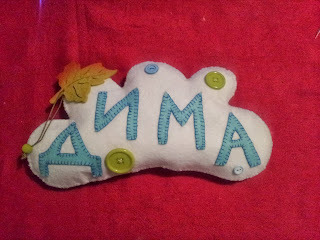 Last but not least use your imagination, I also used different size/colour buttons and a felt maple leaf for decor. 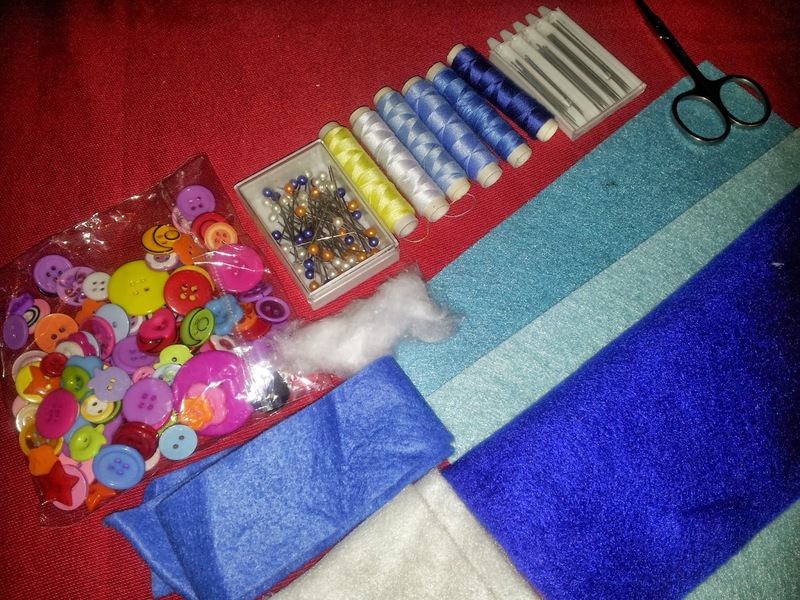 If you want to know where I got it all, I will be posting a separate blog post. Draw and cut out paper shapes of a cloud, baby name letters and droplets. 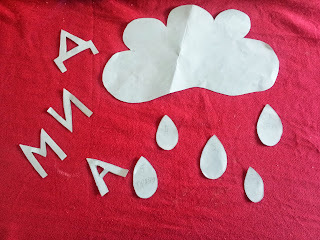 I use ordinary A4 paper, you can use cardboard paper for this too to make your patterns more durable if you want to make any of the crafts in the future. 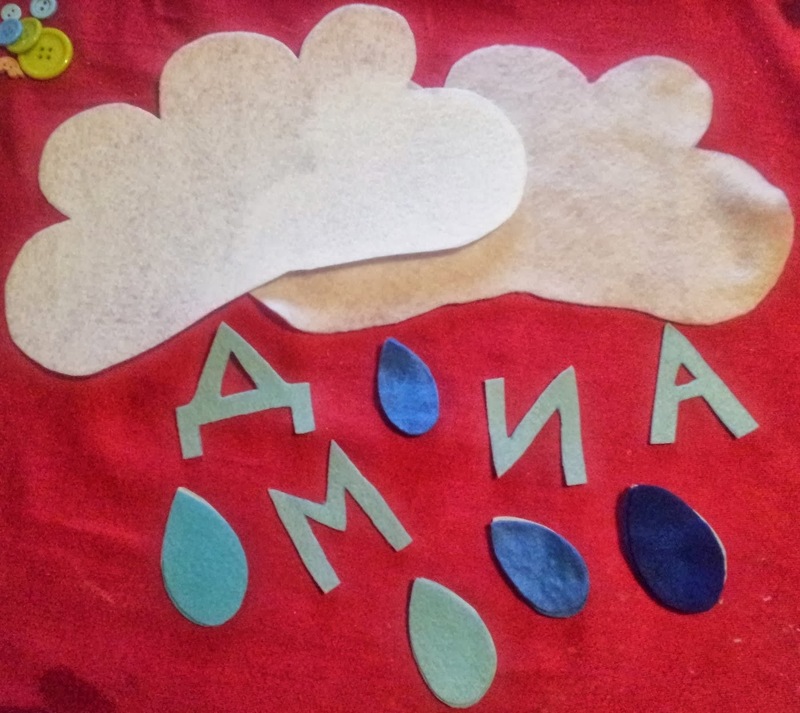 Cut out felt shapes of all your paper patterns. Using a blanket stitch, stitch name letters onto the front side of your cloud. I recommend you to put all decor including letters onto the cloud in a position you want and take a picture of it, therefore when you stitch everything onto the cloud, you will know where to put all pieces so it won't look crooked or too close to the edge. When you are finished with all letters, sew all your desired decor where you want onto the cloud. After you did all the decorating, start stitching both sides of the cloud together, but leave some space at the bottom so we can fill it later. 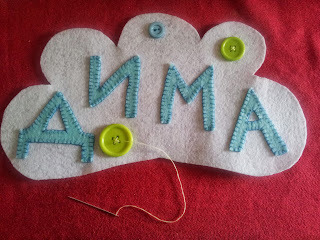 When you get to the bottom part of your cloud, fill it with cotton or any preferred filler material. 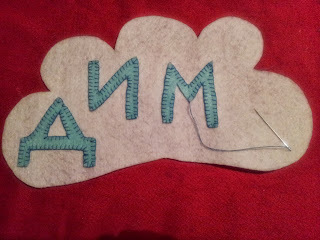 Make sure to fill in every nook and cranny of your cloud. 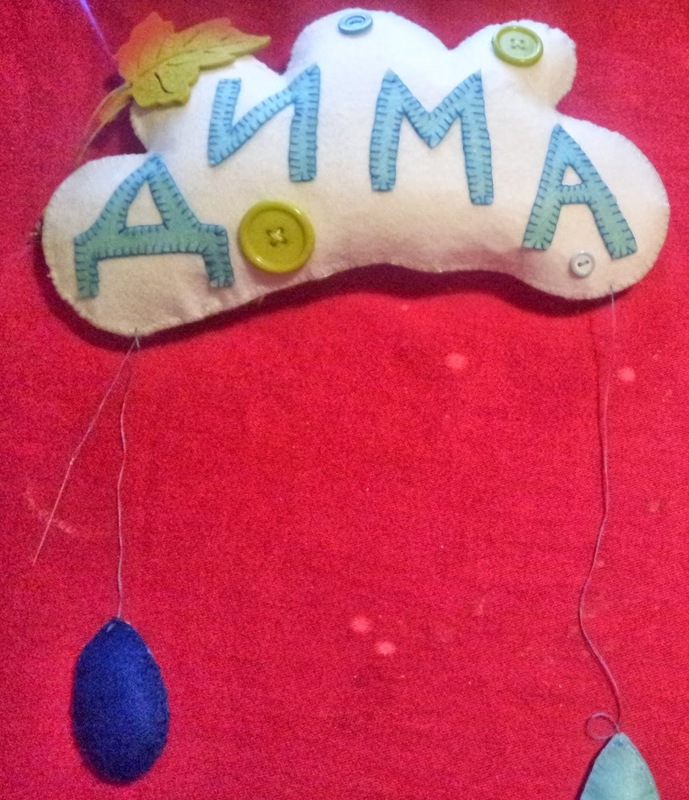 When you are done, sew it up the rest of the way. 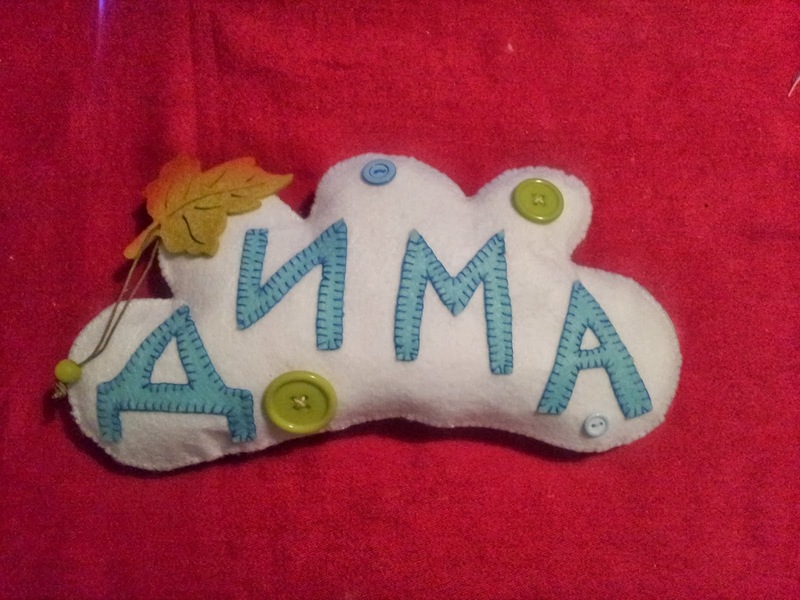 Now that you are finished stitching the cloud, last step to decor is to glue a felt maple leaf into the corner of the cloud. Final step to this tutorial is to stitch up all droplets, I used non matching shades of blue threads for each droplet for some contrast. 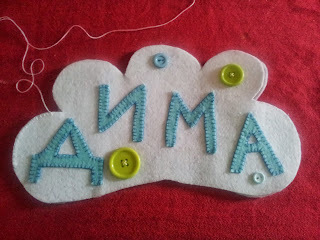 So here is a finished Baby Name Cloud. 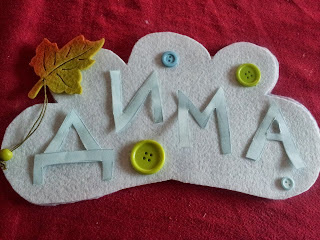 Hope you liked it, and stay tuned for more tutorials and craft related posts coming soon.